Mekia Cox has been tearing it up lately. 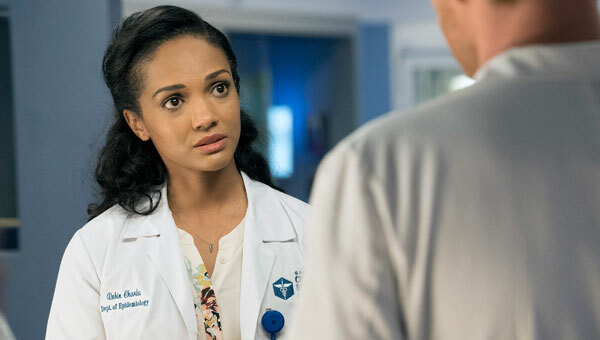 She’s the latest addition to NBC’s Chicago Med, playing the daughter of Oliver Platt’s Dr. Daniel Charles, appeared on several episodes of TVLand’s Impastor and was a regular on ABC’s Secrets and Lies. And to add to her busy schedule, she’s got a set of shows called ‘Broadway at W’ running in W Hotels from New York, Los Angeles, Chicago and London. The busy triple-threat took some time to chat with me about her first recurring role, going on tour with two shows and Chicago Med. How do you like filming on location? Mekia Cox: You know, it’s nice. This is my first time getting to do an extended stay in Chicago and I really like it, especially now because it’s a little bit warmer. But I will say, being on Med, of all the Chicago shows, we’re pretty lucky because a lot of our stuff in inside. So, when it’s cold outside, we’re actually ok because we’re inside the studios having fun. For the other shows, like Fire and PD, they’re outside all the time. I think I had one scene outside this whole season. I don’t know how they do it at all because it can be freezing out here. But, I’m also from LA and Florida and the Virgin Islands, so it’s not weather I’m exactly used too. On the show, you play Oliver Platt’s daughter. Did you spend any time together before shooting your first scene or was it like, “Hi, how are doing?” and then you get to work. Mekia Cox: It’s kind of like, “Hi, how you doing. Alright, let’s go.” It’s very fast. You audition, get cast and two days later, you’re in Chicago. That’s kind of how it happened. So, the first day when I met him was really the first day we were on set and shooting our first scene together. But, he is so great and he’s very easy to work with. He’s sort of an actor’s actor. We met and connected very easily and went from there. I love Oliver Platt. Like you said, he’s got this ease about him and it shows up on screen. He’s so natural. On the show, you’ve got to use all of this medical terminology and it’s got to sound like it’s been coming out of your mouth for years. Mekia Cox: There’s nothing like repetition. That’s really it. There’s certain words in particular and sometimes there are phrases where you really have no clue what you’re saying. So, you have to figure out first what it means and then just repeat it over and over again until it comes out of your mouth like you’ve been saying it for years. Usually, I have to know what the word means but as soon as I say it and we’re done with that scene, it goes way out of my head. I know what it means for the scene and then an episode later, I’m like, “What was that word?” That’s why I could never be an actual medical student. You’ve also done a ton of co-star and guest star roles. I’ve done them myself and for me, it’s always tough. You’re always the new person on-set and along with wanting to do a good job, you don’t want to do anything stupid or look like a jackass. At least that’s how I feel. Did it get any easier? Mekia Cox: Not really [laughs]I will say that the guest star roles don’t get any easier. The recurring, initially, it was that nervous feeling then after a while, yes, it does get easier. When you’re with a group for an extended period of time, you get to know them, they get to know you and you’re less worried about all that stuff. It’s like being the new kid in school. When you’re first there, you’re like, “Oh God, will these kids like me? Will I be good?” And then after a few months, you’re all acclimated and everyone’s friends and it makes things a while lot easier when you’re on set. And, you know, when you’re first there and you maybe fumble a word or one of your lines you think, “Oh God, my career is over.” [laughs]But once you’re a few months, you’re a little more used to it, you realize everyone goes through that at some point in time. What was the feeling like when you got your first recurring role? You went to Florida State. How was the musical theatre program there? Mekia Cox: It was a lot of fun. I’m still really good friends with everyone. At the time, we had the biggest class. It was a very small program so our class was 7 people and that was a really big class for that time. And around that time, I think, Florida State was in the like top 3 for musical theatre, the top three schools to go to. And actually, me and some other alumni who graduated that year are going back to do a summer intensive workshop for the kids, which I think will be a lot of fun. It’s good that you’re giving back. Mekia Cox: Yeah, it’s always nice to give back, especially to your alma mater. It’s fun when you get to see other kids, other people, do good work and you get to help them do good work, it’s really fulfilling. You said you went on tour after college? Mekia Cox: I toured with Fame, the Musical and Smokey Joe’s Café. How did you like going on tour? Mekia Cox: It was amazing at the time. You’re a kid and you have your freedom. You get to see all fifty states and it was just a ton of fun. And actually those people, I’m still really close to this day. It was a bus and truck tour and we had some interesting times. At the time, I think it was exactly what I think I needed coming out of school. When was the last time you did a show? Obviously, you have this deep musical theatre background, are you jonesing to do a full on show? Mekia Cox: Yeah, pretty much. It’s been a while since I’ve done a show. I think the last thing I did was Ragtime and then I did Rent. That was 2008? 2009? But, because of that urge and that need, I actually started a production called 42 Seven Productions. That all started out of my yearning for theatre and my love of it. I wanted to bring a little of New York and theatre out to LA. So, some of my best friends from Florida State, along with a couple of other people, we formed this company and we now have numerous outlets at W Hotels called Broadway at W. We have actors who are in Broadway shows, after their show, they come over and they do like a cabaret… it’s hard to say cabaret because it makes it sound musical theatre-y but it’s really a tap/jam session. We started out in LA, we now have one in New York, Chicago and it looks like we’re about to open one in London. It’s all happened very quickly. So, that’s the reason why I haven’t done a show in like forever. Finally, what was your worst audition ever? Mekia Cox: Probably my very first musical audition in New York. Because at least with acting, you can semi-cover up the fact that you’re nervous. But, when you have to sing, the quiver in your voice can show when you’re singing. I’m pretty sure that was my worst audition. Lance Carter is an actor and the Editor of Daily Actor. Interview: ‘Waitress’ Star Eddie Jemison Talks Ogie, His Broadway Debut and More!